Vegetable juices, particularly those made using beetroot/beet or kale, can take some getting used to, but it only takes a couple of delicious drinks like this one to get the taste. 1. Top and tail the carrots and chop any large ones into chunks. 2. Remove the tough stalk from the beetroot/beet but keep the leaves, if you like. 3. Core the apple, removing any tough stalks, and peel the orange, leaving the pith on. 4. 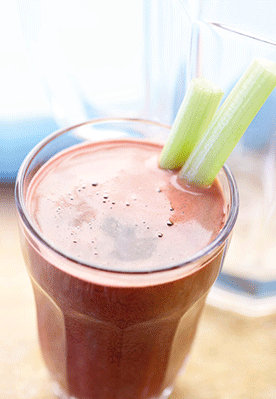 Chop up the celery to fit your juicer, but keep the green leafy tops. 5. Give the kale leaves a good rinse in a colander, then tip them into a clean dish towel and pat them dry. 6. Push everything through the juicer, adding the celery tops, beetroot/beet leaves, if using, and the kale with the solid ingredients. Give it all a good stir to combine, then pour into a tall glass. 7. Serve it with extra celery stalks, if you like, so you can stir it up between sips, then eat them at the end for a refreshing crunch! Nutrients: Beta-carotene, folic acid, vitamins B3, B6 and C; calcium, iron, magnesium, manganese, phosphorus, potassium, sodium and sulphur.